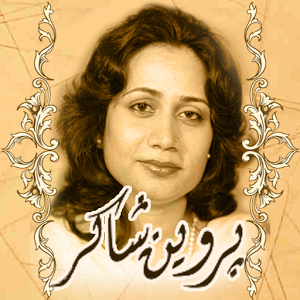 Parveen Shakir (24th Nov 1952 – 26th Dec 1994) was an Urdu poet, teacher and a government worker of the Government of Pakistan. Parveen started writing at an early age and published her first volume of poetry, Khushbu [Fragrance], to great praise, in 1976. She subsequently published other volumes of poetry – all well-received – Sad-barg [Marsh Marigold] in 1980 (24th Nov 1952 – 26th Dec 1994) was an Urdu poet, teacher and a government worker of the Government of Pakistan. Parveen started writing at an early age and published her first volume of poetry, Khushbu [Fragrance], to great praise, in 1976. She subsequently published other volumes of poetry – all well-received – Sad-barg [Marsh Marigold] in 1980, Khud Kalami [Talking To Oneself] and Inkaar [Denial] in 1990, Kaf-e-Aina [The Mirror's Edge] besides a collection of her newspaper segments, titled Gosha-e-Chashm [Corner of the Eye], and was awarded one of Pakistan's highest distinctions, the Pride of Performance for her extraordinary commitment to literature in 1976. The poetry books are collected in the volume Mah-e-Tamaam [Full Moon] with the exception of Kaf-e-Aina. Parveen died in 1994 out of a pileup while on her approach to work. Parveen started writing at a youthful age, penning both prose and poetry, and contributing sections in Urdu newspapers, and a few articles in English dailies. At first, she wrote under the pen-name, "Beena". Shakir held two master's degrees, one in English Literature and one in Linguistics. She likewise held several degrees and another master's degree in Bank Administration. She was an instructor for a long time before she joined the Civil Service and worked in the Customs Department. In 1986 she was designated the second secretary, Federal Bureau of Revenue in Islamabad. Shakir employed principally two types of poetry in her work, one being the prevalent ghazal [ghazalyaat], and the other being free verse. The most prominent themes in Shakir's poetry are love, feminism, and social marks of disgrace, however, she periodically wrote on other points also. Her work was often based on sentimentalism, exploring the concepts of love, beauty and their logical inconsistencies, and heavily integrated the use of metaphors, similes and personifications. Seemingly, Shakir can be termed the main female poet to use the word larki (young lady) in her works—the male-dominated Urdu poetry scene seldom employs that word and uses masculine grammar when discussing the 'lover'. So also, she often made use of the Urdu first-person, feminine pronoun in her verses which, however extremely regular in prose, was rarely used in poetry, even by female poets, before her.